I've been looking forward to the finale of the Gears series for months now. While I had been following the pre-release media somewhat closely, I made sure to avoid any particular "plot" previews (other than what was included in trailers for the game) and carefully avoided anything containing spoilers. I'm glad I did, because the little media I did see started giving me a sour taste of how the plot was going to go in this game, and I was pleasantly surprised to find that Epic completely threw what I was thinking out of the window and made the game that should have ended the series. In Gears of War 3, humanity is tired. They are on the move trying to stay clear of yet another new threat, the Lambent. As the game starts, you might get slightly frustrated in the number and frequency of "walking, talking on comms" areas, but, as the game progresses, you begin to appreciate the story progression you can find in these parts. Additionally, Epic has added a "slow jog" to walking areas, which helps you feel like you are actually getting somewhere. I didn't say nothing cool ever happens. Before we get into the meat of the review, I would like to just mention the graphics. 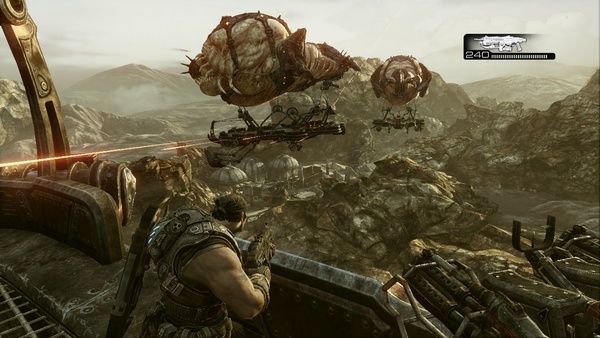 Gears 3 is, hands down, the best looking 360 game available to date. Recent enhancements to Unreal Engine 3 are painstakingly at work here and make the game incredibly gorgeous. The lighting, in particular, is a huge departure from the previous two games, and you go to far more exotic locations with many, many outdoor areas unlike the first two games which happen indoors for the most part. There were many times where, graphically, I sat in wonder at how great a certain effect was or how bright and beautiful an outdoor area was. Unreal Engine 3 has come a long way in the last 3 years and it absolutely shows here. Unfortunately, the side effect of this is that the engine is clearly pushing the limits of what the 360 can do, and there were several areas where I noticed the framerate dragging. Still, although this happened, the framerate issues rarely happened during actual firefights, and, even when they did, they never affected my shooting or got me killed. In terms of sounds and music, the game is as good or better than previous games in the series. Voice acting is extremely well executed, particularly on the female characters. The soundtrack is as fitting as the rest of the series, and several scenes have throwbacks to previous trailers and events in the series in audio form. I can't really explain what I mean without ruining a couple of well beyond perfectly executed cinematics that really just need to be experienced to get the full meaning. The gameplay in Gears 3 is as tight as ever. Combat controls are slightly more forgiving, active reload is a little kinder (particularly on getting the stronger bullets, you can hit the edges of that area to get the effect whereas in previous games it would be less kind to you), the overall controls are smooth and tight and you never feel like you got ripped off of a kill because of movement delays or anything. Cover, as usual, is everywhere in this game. Unlike previous games, however, cover is literally set up EVERYWHERE, making every area feel more like an abandoned war zone instead of an encouragement to hide while an attack is taking place. Additionally, cover seems to matter a bit less in this game as there is much more encouragement to grab something like a Retro Lancer and charge up in the middle of your enemies. I found myself preferring to strafe and shoot than stick up in cover in many situations and that rarely failed to be successful prior to the last few chapters of the final act. Overall, the gameplay is executed with such finesse and quality that it is difficult to find a single thing to criticize here. The plot. Ah, the plot. 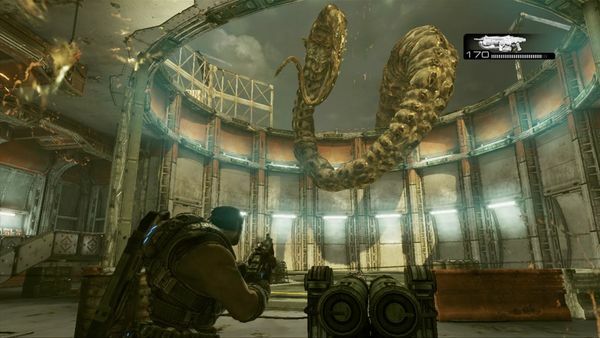 Gears 3 is not your grandma's trilogy ending film. Lots and lots of questions are answered in this game and very few questions are asked. In fact, I can only think of two loose ends from this game, and I have no idea where Epic would go with either of those if they were to attempt a full new game. The plot runs you through the full gamut of emotions, there are victorious moments, times of tragedy, and periods of extreme hopelessness in your situation. 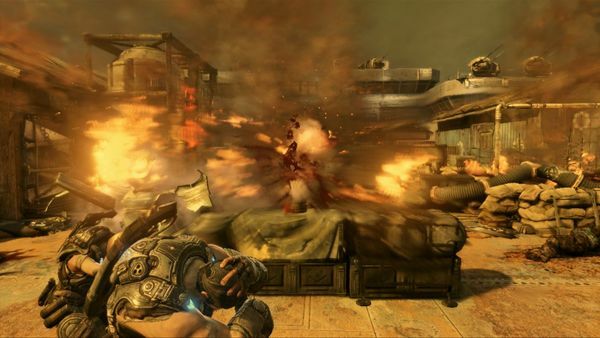 Gears 3 does an excellent job, through voice acting and situational emotion, of getting you to feel what is going on. This is partially helped by the fact that Delta Squad employs a couple of women now. The women really enforce the delivery of the plot, having a non-steroidal beast of a human as part of the core squad does so much more than anything else Epic could have done here. Anya Stroud rocks! In terms of game modes, everything is back and more. The Campaign now also has an "arcade" mode where you can compare kills and points for various actions with your friends. A little competition never hurt, right? There are also apparently more Campaign game modes coming as there is a third option there titled "COMING SOON". Wonder what that will be? 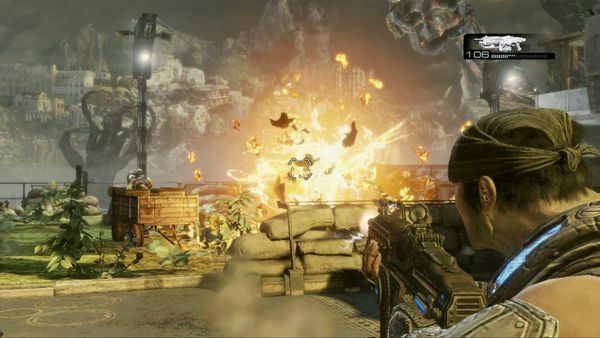 Gears 3 also introduces 4-player co-op through the campaign. To accommodate this, you often have four squadmates running around you and it reinforces why Epic was hesitant to add this in the first place: 4 people running around tends to result in LOTS of friendly fire. Be that as it may, though, it IS great fun to have four real humans playing at once. If nothing else, it really helps your strategy of dealing with several areas in the game. Versus has all the modes it had before and I only really tried Team Deathmatch. It's probably not a huge secret that I'm not a fan of versus multiplayer games on consoles. I am much more interested in co-op. However, it does seem that the dedicated server support for Gears 3 is having a massive net positive effect on the overall online experience. I'm sure many of you know how much it sucked playing Gears 2 online, whether it was from a laggy connection, a terrible host, or a complete failure of Live to succeed with matchmaking. Pretty much all of those issues seem to be resolved in Gears 3. Playing online in Gears 3 feels extremely smooth in comparison and the matchmaking operates much more quickly now. All in all, playing online is a much nicer experience now. Beast mode is a nice addition. 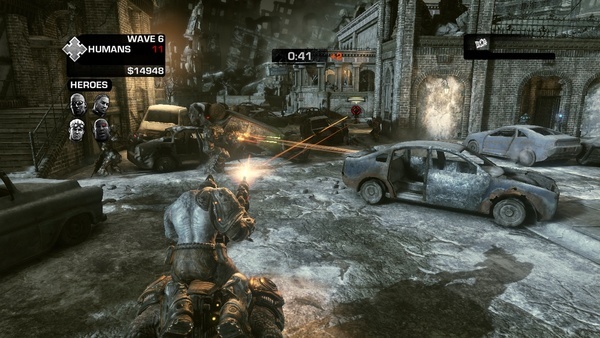 Overall, Gears 3 is about as flawless of a presentation as you are ever going to get. The game reflects the kind of quality, care and affection that we all expect out of Epic Games. If there were anything to criticize in this game, it would be that, unlike Gears 1 and 2, there are not any "WHOA!!!! AM I REALLY DOING THIS?!?!?" moments in Gears 3. Instead, there are many "Wow, this is sooo cool" moments. The level of polish here is simply amazing. So, does the game deliver or is it stale? If you have a 360, it ABSOLUTELY delivers and is a must-buy for sure, if only to see how the series ends but there is boatloads of value here for competitive multiplayer fans and the co-op legion. You aren't going to feel bad paying $60 retail for this one at all. So I guess there is only one thing left to ask. You'll just have to wait and see to find out the answer to that one! When is Gears Trilogy coming to PC?